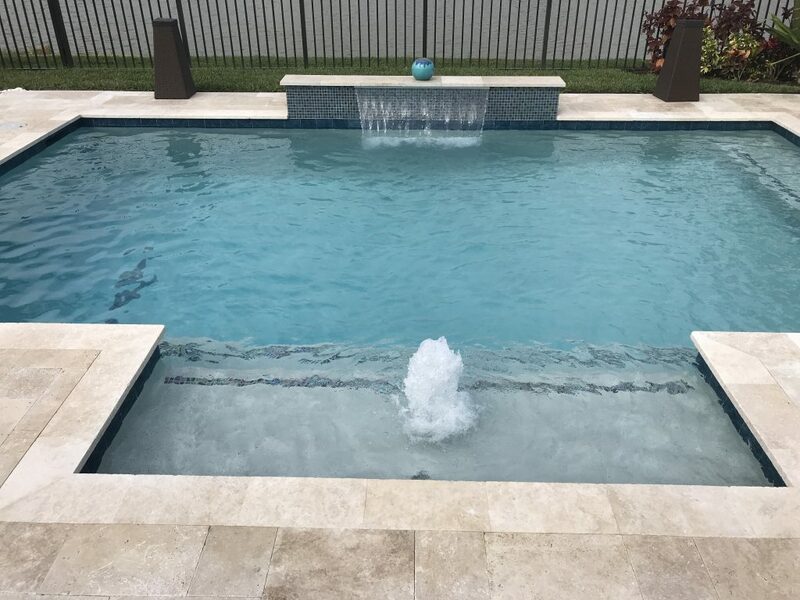 This month, we head to Parkland to show how this family took a standard pool and added all their own customizations to make sure that they created their ideal swimming pool and backyard oasis. 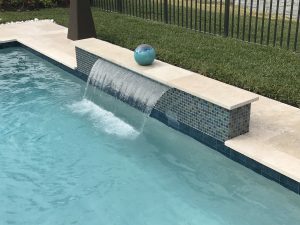 For those that think having your own pool is not possible, here we show how a family created unique solutions side-by-side with our Treasure Pools team to ultimately create their dream pool. First we start with the basics of the pool. This pool has a raised wall along with a 4 foot waterfall. Waterfalls, and other water features, are a great way to add those elevated aesthetics without completely breaking the bank. The look and feel of the waterfall really brings a great visual to life for you and guests. Another solution that this homeowner utilized was adding in therapy jets to an extended bench. 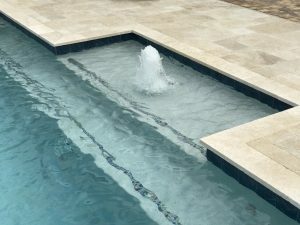 Swimmers can still get the benefits of the jets without having to add an entire spa to your pool, which can be very costly. There is also a great sun shelf with bubblers and an umbrella sleeve that gives you the option for shade during those really hot days. Sun shelves are great for families with children of all ages. On the backend, this pool has a salt system and energy efficient speed pump. We talk about these often as they are great additions that end up saving you money and time down the road. We highly recommend these investments. The last, unique component to this pool is the pavers. This homeowner chose to go a new route by installing a paver by Artistic. Many people are now steering away from travertine and utilizing this new paver that is less porous and more compressed. They look and feel great! It’s always great welcoming new clients to our Treasure Pools family! If you are interested in possibly creating your dream backyard oasis, now is the time. Contact us today to learn more.